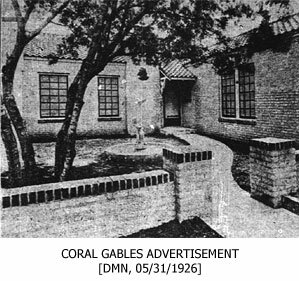 On April 25, 1926 an advertisement published in the Dallas Morning News (Section VI, page 15) reads, “Coral Gables! A touch of beautiful and exquisite Florida transplanted to Dallas! Of course, you have heard of Coral Gables of Miami, Florida. Million upon millions of dollars were expended in creating possibly the most beautiful and exclusive subdivision in the world at Coral Gables, Florida. It is a “show place of the first water”. Coral Gables in Dallas is not the name of a subdivision, but is the name we have given a unique, Spanish cottage home, now being erected [on Seevers Avenue] in the most beautiful subdivision in Dallas – Beckley Club. We have named this home Coral Gables for two reasons. 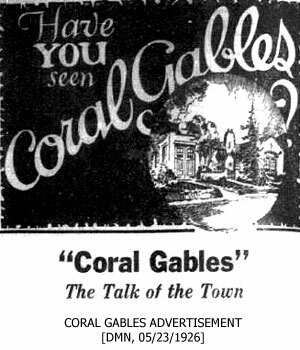 First, because it, like the original Coral Gables, is of the finest and unique in its class; second, it is of Spanish type, with numerous unusual and attractive features. For instance, it has a lovely patio, enclosed on three sides by the walls of the house, the other side being a low, brick wall with wrought iron gate. There will be a tinkling fountain in the patio, with basin for gold fish and water lilies. The garage, of brick the same as the dwelling, is an integral part of the house so that when the owner drives in the garage he is practically in the house itself. An ultra modern arrangement and one that is certain to become popular here as it has in many other places, such as Coral Gables, Florida. Truly, to the lover of the unique, rustic and beautiful in a small home, Coral Gables is a “Dream Home”. It is the “last word” in the new-old Spanish type of small house; and if you contemplate buying a home, or a lot upon which you expect to build, it behooves you to see Coral Gables. Coral Gables is being built of a light cream brick with mortar to match, giving it the appearance of stucco at a little distance. The roof is to be of genuine clay tile, such as only the very finest homes have. The gables – three in number – are brick to the roof. The porches are all of concrete and everlasting. Even the garage hardware is massive and in keeping with the improvements. This lovely Spanish “Hacienda” is located in a veritable park of oak and cedar trees. Clumps of fine young oaks occupy a corner of the patio, their branches over the roof of the garage. From the Living Porch in the rear of the house there is the “Bright Angel’s Trail” leading to the bank of the lake, ten feet deep, where the owner of this home may indulge in fishing, boating and swimming – without leaving home! This is a home of surprises. In addition to the unusual features mentioned, there are other surprises in store for visitors to Coral Gables, in beautiful Beckley Club such, doubtless, as you have never seen before. […] S.A. Temple, Owner”. 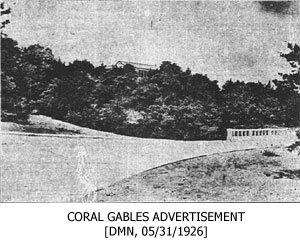 An article by Idalea Andrews Hunt, titled “Coral Gables, Dream Spot in Beckley, Opens”, was published May 16, 1926 in the Dallas Morning News (Section IX, page 1). It reads: “Did you ever motor leisurely along avenues of homes, just houses provided with walls and roofs and the requisite number of windows and doors, and then suddenly catch your breath and gaze in silent wonderment at a house really worthy of the appellation “home” – one which makes you fight down the desire for immediate possession? Such is Coral Gables, that charming bit of Florida’s wonderland transplanted to Beckley Club, one of Dallas’ newest additions, which will be formally opened to the public Sunday. Truly, Aladdin, with the aid of his marvelous lamp, never saw anything in the Arabian Nights more wonderful. It is a place of dreams, a symphony of sylvan music – a place of romance, where one can read the poetry of life to the heart’s content. The small house of today is no less a masterpiece of architectural skill and artistic achievement than the princely mansion. But it is only once in a blue moon, that the ideal occurs as one finds manifested here, when the owner, the architect and the landscape gardener have worked together in its evolution. The site chosen is hardly eclipsed by the famous sections of Florida or California. The dwelling nestles in a virgin grove of great oaks and cedar flanked at the rear by a picturesque rugged ravine, backed by entrancing woodland and bordered by tangled native shrubs. Upon a visit to this “dream house”, all will feel with Emerson, “That each should in his home abide, therefore is the world so wide”. And all will declare with finality that we were not intended to be piled up like bricks in a wall, but each to a have a home worthy the name; to have a more intimate knowledge of our inheritance of the earth and a better appreciation of its beauty and usefulness. Such a charming home makes the beholder wonder at the blinding spell of narrow, crowded, city lots. It makes you wonder why not every one builds a bit of a house out, where trees grow, and birds warble in happy abandonment. For such spots in God’s great out-of-doors are so responsive to our overtures of friendship. For one seed down one reaps a thousand fold and for a little affection a constantly changing panorama of beauty and a full measure and running over of happiness. This dwelling is a happy combination of substantiality, practicability, and artistic achievement in a wholly modern Spanish type into which an American spirit has been breathed through the skill of a discriminating architect.